Filing for bankruptcy can be an intimidating process. But if you find yourself financially drowning, bankruptcy can be the lifeline you need to get back on your feet. While bankruptcy does bring its share of complications, those are also accompanied by several benefits. One of these benefits is the Automatic Stay. The Automatic Stay is possibly the most important advantage of a bankruptcy case. This single-page Federal Court Order is activated automatically by the U.S. Bankruptcy Court as soon as you file your petition. This injunction provides you with instant protection, and alerts creditors that a bankruptcy case has been filed. It puts an immediate stop to most collection activity and lawsuits against you or your business. Creditors who pursue debt collection after the automatic stay is in place could be in violation of the Fair Debt Collection Practices act. The object of the automatic stay is to keep creditors from seizing assets. Once bankruptcy has been filed, creditors will likely only receive a portion of what they are owed. The automatic stay is not impermeable. In certain circumstances, creditors can file a motion to lift the stay. It doesn’t happen often, as the burden falls to the creditor to show the court the validity for doing so. Creditors who already have proceedings underway are the most likely to petition for a lift of the stay. Landlords may ask to initiate or continue with an eviction. Secured creditors, like mortgage lenders, may ask for a lift when there isn’t equity enough to cover a loan. Because you are going to be required to pay for property that is collateral for a debt – such as your automobile or house – the court will generally lift the stay if you are unable to bring the payments current. The court may also grant a lift if an unsecured debt won’t be wiped out in a Chapter 7 case. The Automatic Stay lasts as long as the bankruptcy does. The stay ends if the case is dismissed. But the length can vary based on the type of bankruptcy filing, since Chapter 7 cases are much shorter than Chapter 13. In Chapter 7 cases, the stay lasts three to four months. In Chapter 13 cases, the stay can continue for up to 63 months. Since Chapter 7 cases last only a few months, most creditors don’t bother filing for a lift of the automatic stay. And in Chapter 13 cases, you are required to repay most debts in full over the course of the payment plan, so again, a lift isn’t beneficial to the creditor. Does the Automatic Stay Apply to Both Chapter 7 and Chapter 13? Yes, the automatic stay is implemented as soon as your case for bankruptcy is filed, whether a Chapter 7 or a Chapter 13. The automatic stay is applicable to businesses and individuals. The shorter length of protection under Chapter 7 may be just what is needed if the remaining debts can be negotiated. But the length of stay under Chapter 13 offers lengthy and more extensive protection if there is collateral to be maintained. 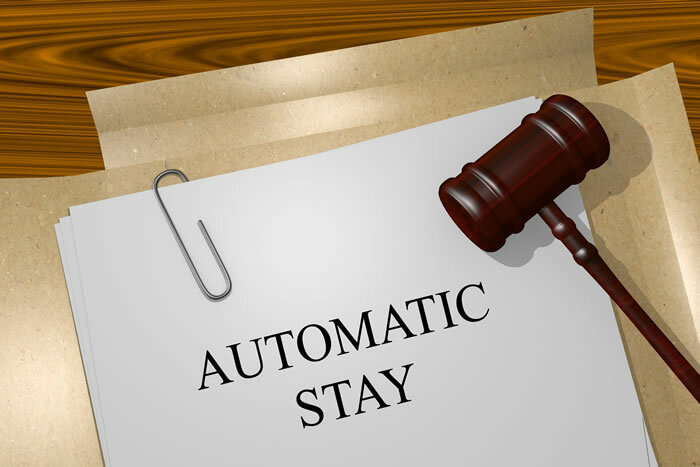 With either case, the Automatic Stay serves its purpose in protecting you from creditors, giving you time to negotiate and settle your debts without further loss.